Hi friends! 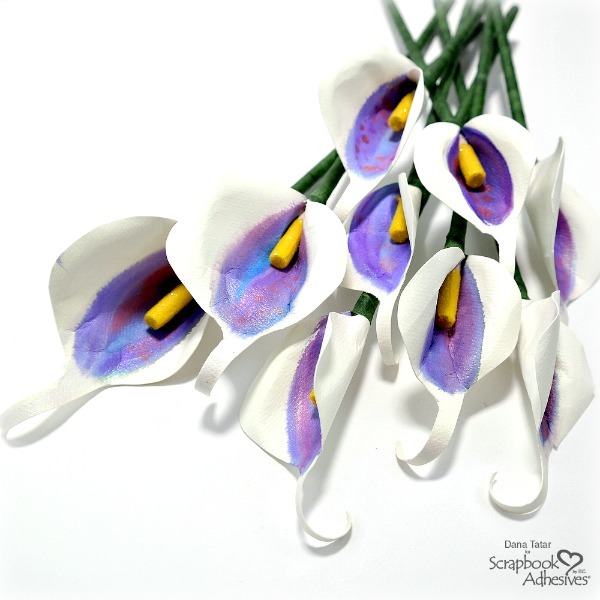 Dana Tatar here today sharing how to create a paper calla lily bouquet. I love the look and scent of fresh flowers, but I usually only splurge for a bouquet on special occasions. The wall vase in my kitchen is something that I don’t like to leave empty. 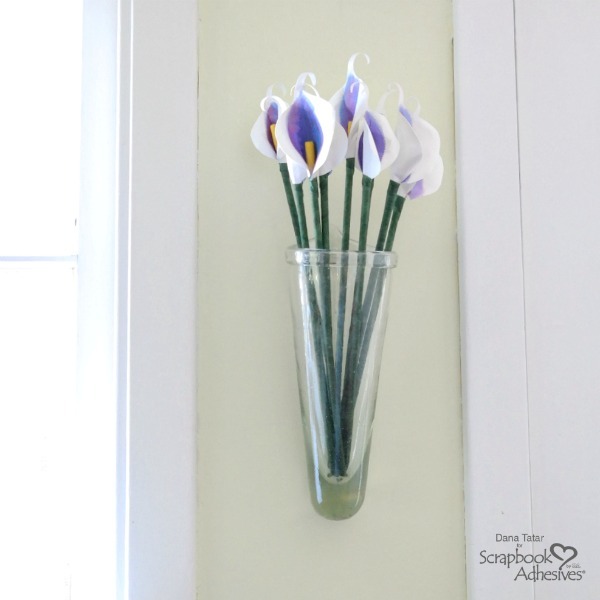 I created a paper bouquet of calla lilies, my favorite, to add a bold pop of color to my space. My flower-making skills are at a beginner level, so this simple design was perfect for me. I used iridescent watercolors to paint a bold center for the flower petals. I wrapped the paper petals around wood dowels that I covered with a glittered yellow flock for the stamen and green floral tape for the stem. Step 1. 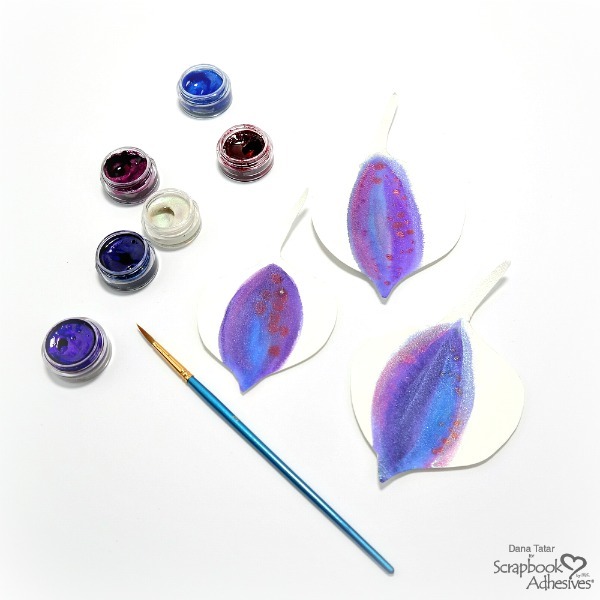 Use a petal template to trace petal shapes onto a piece of watercolor paper. 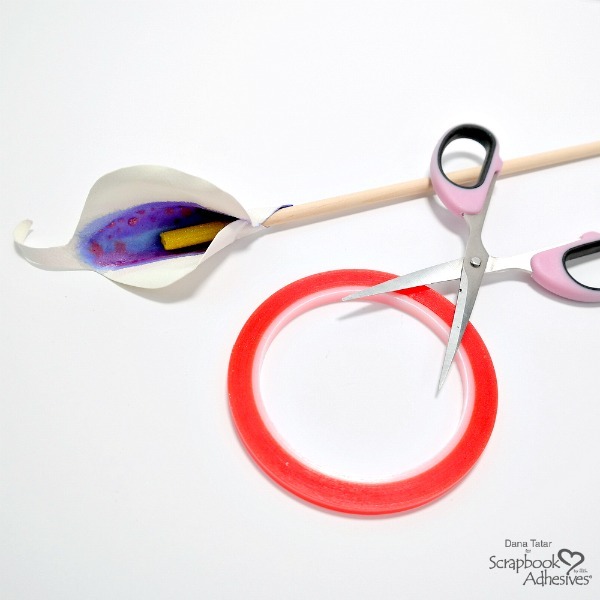 Cut out the paper petals with scissors. I found a clip-art animal (stingray) that I thought looked like a lily petal as a template for this step. I printed out two sizes to add variety to my bouquet. Step 2. Use watercolor paint to add color to the center of the flower petals. Let dry. 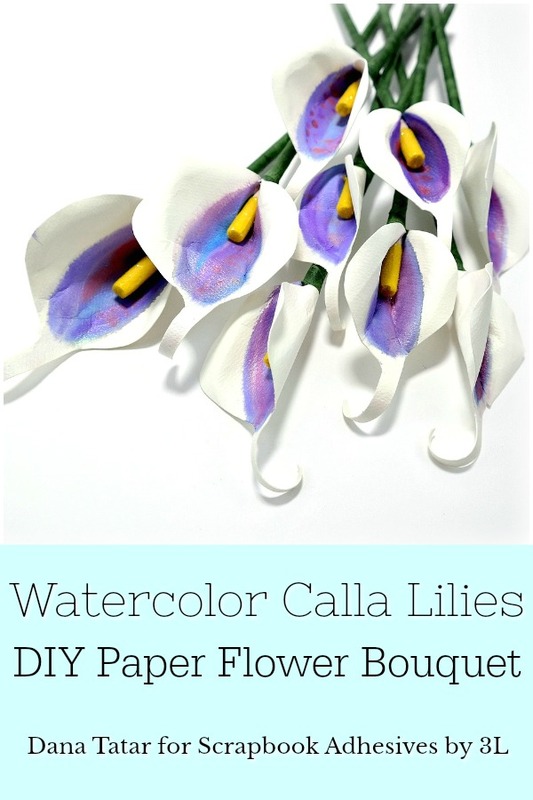 My favorite calla lilies have white petals with a dark purple center. I used red, pink, blue, purple, and white paint. Any color palette and a full-coverage paint application would also work for this step. Step 3. Create a flower stamen for each flower petal. Apply a Small Adhesive Dot to the end of a wood dowel. Next, apply Adhesives Lines around the top. Press the adhesive-covered end of the dowel into yellow flock. Gently tap the dowel to remove any excess flock. Step 4. Bend and curl a dry flower petal into the desired shape. 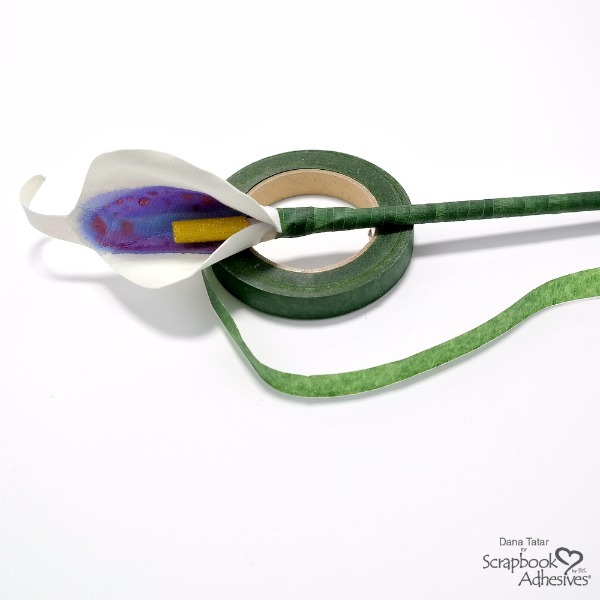 Attach the flower petal to the wood dowel, just under the flocked stamen, using Extreme Double-Sided Tape. Step 5. Wrap the wood dowel with green floral tape. The floral tape is more tacky than sticky. 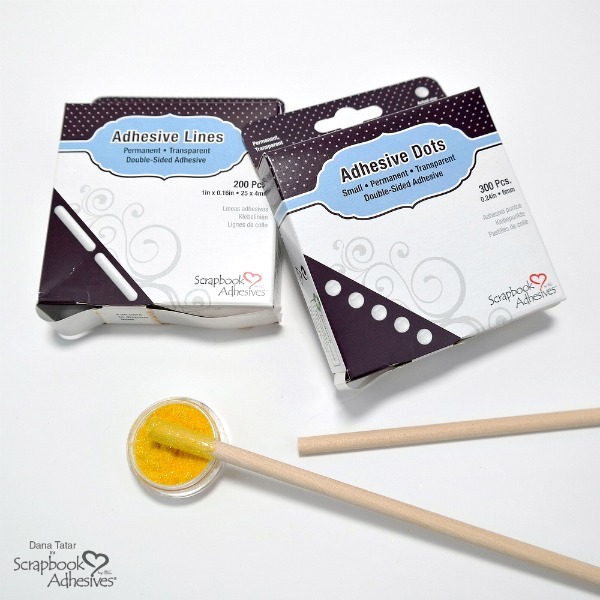 Use a Small Adhesive Dot to secure the ends of the tape to the dowel to prevent unraveling. I hope I have inspired you to create your own paper bouquet. Thanks for stopping by today! This entry was posted in 3D Projects, Adhesive Dots & Lines, Adhesives, Beginner, Crafts & Tutorials, Extreme Double-Sided Tapes, Home Decor, Mixed Media, Permanent Adhesive, Skill Level, Tutorial, Wear your Adhesive on the Outside and tagged Adhesive Dots Small, Adhesive Lines, Calla Lily, Dana Tatar, Extreme Double-Sided Tape 1/4", Flowers, Home Decor, HomeHobby by 3L, Papercrafts, Tutorial, Watercolors, Wear Your Adhesive on the Outside. Bookmark the permalink.